Although day 1 of HH30 was a bit bumpy for me, day 2 was smooth sailing. I even managed to create this killer smoothie recipe. It tastes just like Neapolitan ice cream (a combo of vanilla, chocolate and strawberry) only it's instant to make and a whole lot healthier! Now you can have "ice cream" for breakfast! By the way, I was featured on Women's Day magazine on Friday. Go check out my healthy snack tips! 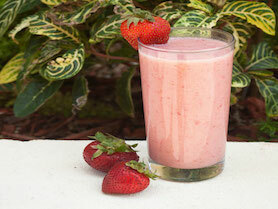 This smoothie changed my life... it's like Neapolitan ice cream... but better! Combine all ingredients together in a blender and whiz until smooth, adding more non-dairy milk as necessary.